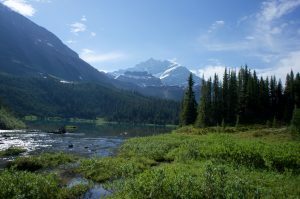 Lake Louise may have spectacular peaks and easy camping, but it is not a suitable base. Its one grocery store is a tiny, cramped thing with absurd prices: $4-5 for a loaf of sandwich bread, $3 for a can of tuna or a Clif Bar. I had other peaks to climb in the area, but I was running low on supplies, so I decided to head up the Icefields Parkway to Jasper, with a stop along the way. Just like in 2014, I found the Edith Cavell road closed, this time due to parking lot construction instead of a washout. 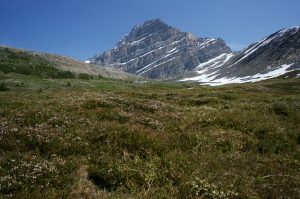 The closest thing I could do on short notice was Mount Fryatt, reached via the familiar Geraldine Lakes trail. The standard southwest face route sounded unremarkable and unpleasant, but the west ridge looked like it might be more interesting, and the 5.6 crux was conveniently at its base. It had been partly cloudy on my drive past the Columbia Icefield, so I waited until around 7:30 to start, when I could be certain that the sky was gray from forest fire smoke instead of clouds. The Geraldine Lakes trail starts out smooth, but soon turns rooty and boggy, and only gets worse as it climbs past three lakes to its official end at a campsite. Canada takes a strange approach to maintaining its park facilities. In the US, backcountry sites will almost never have infrastructure unless they can be reached by pack animals. Canada happily helicopters all sorts of things into the backcountry, from huts in the middle of nowhere, to a couple of picnic tables and an outhouse at the end of this obscure, barely-maintained trail to nowhere. Perhaps related to this difference, while backcountry camping is generally free in US National Parks, Canada charges a ridiculous $10 per person per night, even in undeveloped areas. Anyways… where a bridge crosses to the campground, a cairned trail continues up the Geraldine Lakes drainage past two more large lakes. The trail to the first lake is fairly wretched, passing through a brushy swamp. 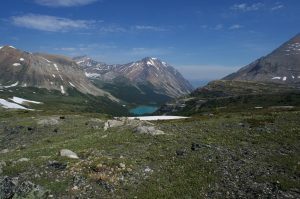 After fording the first lake’s outlet (calf-deep), the trail improves in the more open terrain, before fading and disappearing above the second lake, where Fryatt’s sheer north face and glacier come into view. From there, it is only a short distance to the alpine. Near a small waterfall, I mistakenly followed what turned out to be a very well-maintained trail crossing the drainage, eventually ending up north of Fryatt’s west ridge near the glacier’s outlet stream. Once back on route, I followed a much fainter goat path mostly along the ridge crest to the first steep step. The guidebook describes a crux 5.6 pitch to get around the headwall on the north side. I found a short dihedral with a cairn and rap station above, which felt easier than 5.6 (easier than Deltaform’s crux in the same trail runners). 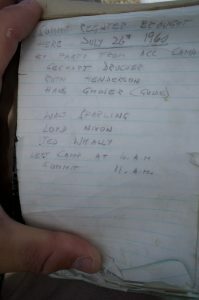 Given the apparently small number of people who climb this route, and the fact that one normally descends the southwest face, I was surprised by the amount of tat I found. After a bit more 4th class choss, I emerged above the step to find acres of talus leading to some bulbous, crappy-looking black cliffs. After hiking the talus, I peeked around the left side of the cliffs to find a couple of steep cracks not to my liking. Traversing right, I found a convoluted route next to a semi-detached pillar leading to lower-angle ground. 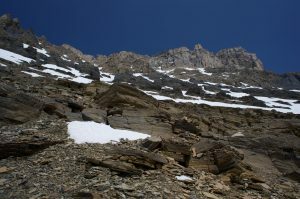 The rock generally slopes down to the northwest, so the holds are best on the southwest side. The pattern continued for awhile, with low-angle choss alternating with steps attacked directly or to the right. The guidebook had mentioned good climbing on solid yellow rock, and I was becoming disappointed with the ridge’s continued chossiness as I gained elevation. The ridge eventually delivered, and I enjoyed several sharp, sticky, well-featured pitches on or just right of the crest, none of which felt harder than the 5.6 crux down low. Just below the rap stations where the west ridge joins the southwest face route, I even gratuitously climbed a steep dihedral just because I could. The guide described a 5.8 pitch on the ridge higher up, but I apparently bypassed it without even noticing. Following the ridge to the black summit blob, I traversed around to the south side rather than assaulting the choss directly. I had hoped to have views of the Columbia Icefield to the south, but the smoke made everything farther away than Edith Cavell hazy and indistinct. I took the time to dig out the lighting-melted copper register canister, and was greeted by a piece of history. 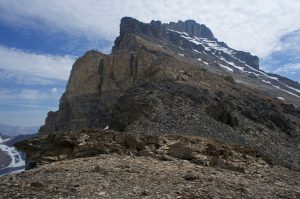 The amazingly-surviving register had been placed in 1960 by Hans Gmoser, one of the second-generation pioneers of Canadian mountaineering. I sat and breathed the smoke for awhile, then started trying to find my way down the unappealing southwest face. 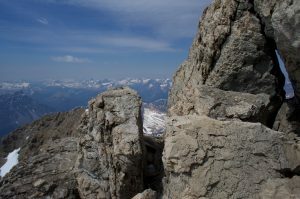 I retraced my steps to the rap station, then made my way down some confusing chossy ledges and low 5th class steps, losing the intermittent line of cairns. There was more snow on the face than I had expected, and I was pleased to find that it was possible to safely plunge-step down the larger patches. 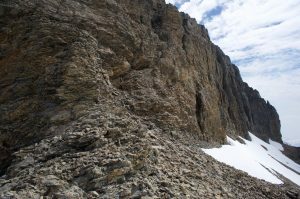 After making my way down one large snowfield, I downclimbed some black choss until my choss-sense told me I was likely to cliff out below. I traversed down and left, eventually reaching another snowfield leading to the lake below. This compacted, lower-angle avalanche debris even made for decent boot-skiing. I probably should have dropped down-valley from the lake and traversed around the west ridge on heather, but I started my traverse at the level of the lake. After some miserable side-hilling, I rejoined the ridge right at the base of the crux. Had the snow been better consolidated, I could have saved time by sliding north, but I stayed on the ridge instead, startling a mountain goat as I came around one corner. I eventually dropped to the center of the valley, descending easy heather slopes and following a stream to rejoin my outbound path at the waterfall. It was a weekend, so I was not surprised to meet a few groups of hikers and campers, including a couple with a giant inflatable pool toy at the middle lake. If I were less tired and more social, I would have stayed to chat longer, but the mosquitoes were coming out and I wanted to be done. I returned to the car after just under 11 hours, a tough but not unreasonable day. I should probably have done something the next day to take advantage of the weather, but it was late and I was out of trail food, so I decided to make the next day a maintenance day, and camp where I was.